This 1973 240Z in Miami, FL has an authentic JDM feel with the original L24 engine still running strong. This 240Z features Mallory Ignition Control, Pertronic electronic conversion, centerforce clutch, a modified exhaust, and a 3.70 limited slip differential. Click anywhere in this box to check the latest price on this Z! The Datsun 240Z offered solid performance the moment it rolled off the factory line, but with any popular enthusiast automobile comes a community of ‘modders’ who seek to improve the performance of their cars. The 240Z’s inline 6-cylinder L-series engine was a great engine overall, but modders commonly sought to get every last bit of horsepower out of the engine possible. Similarly, features like the suspension system and fuel-delivery system were upgraded. Today, modding the 240Z is especially popular due to the age of the car and increased number of options available. Both cosmetic and performance mods are popular, but we are going to focus on performance options in this article. A simple swap out of Tokico struts for worn stock struts is our top recommendation for those looking to upgrade their 240Z suspension. The stock 240Z suspension system was outfitted with independent struts in both the front and rear systems, with the front struts being of the MacPherson variety. While this particular setup was fairly normal for the 70s (in fact it works great today if kept in good condition) many of the aging suspension systems on old 240Zs call for a complete overhaul and often an entirely new suspension system is installed instead. An upgraded suspension system will improve the quality of the ride: reducing body roll, bottoming out, improved cornering and steering response, etc. An upgraded suspension system is both a great complement to an otherwise stock 240Z, and is also a no-brainer if you are adding other mods to your 240Z build. Fortunately, with the 240Z, you have a lot of options! If you decide to upgrade your suspension system, we personally recommend a simple replacement of Tokico Struts and Eibach Springs due to the simplicity of the mod, and it works fantastic. You can actually purchase brand new struts directly from Tokico and they will be a one-to-one replacement of the stock struts. You can read more about this particular replacement, along with many other suspension upgrade options, on our Suspension Upgrade Guide. ZCarDepot sells an EFI retrofit kit that is intended for the 280Z, but can be made to work with L24/L26 engines. While the stock Hitachi SU carburetors often result in a lot of headaches for 240Z owners, they actually do perform quite well when they are completely cleaned and adjusted properly. Even still, some opt to completely swap out the carbureted fuel system for a fuel-injected one. Most EFI (electronic fuel injection) upgrades will require you to also upgrade the fuel system (for a high pressure one) and to use a different manifold such as the L28 manifold (with injectors). Again, this is a difficultmod and is done much more commonly in the 280Z, but some 240Z owners may want to go through and upgrade to newer technology that is fuel injection. 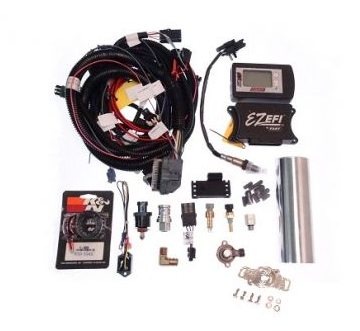 An example of a kit you may want to use is ZCarDepot’s FAST Fuel Injection Retrofit kit. This kit will, in fact, require an upgrade of the fuel system to a high pressure variant, and use of an L28 manifold with injectors as stated before. Getting this particular kit to work with your Z-car is relatively simple as it can tune itself and comes with an easy-to-use handheld touchscreen for inputting engine data quickly. This particular kit is pricey, but in my opinion, seems to be the best on the market for a fuel injection upgrade. You can actually buy brand new Weber carbs on Amazon. Looking to improve your fuel delivery system without completely swapping out your carburetors for fuel injection? You’re in good company. Again, the 240Z’s stock SU carburetors performed quite well when they were in working condition at all, but many still choose to swap them out. The most common carburetor upgrade I see that tends to produce great results is swapping in triple Weber carburetors. You’re going to want three 40 DCOE Webers which can be found used or bought new on Amazon. Weber carbs give off a fantastic sound, making your 240Z a bit more throaty at all RPM bands, while the stock SU carburetors tend to be understated in terms of the sound produced. This is a very popular mod for 240Zs and a great way to pull a bit more performance and sound out of your L24. While the 240Z was a fast, high-performance vehicle the moment it rolled off the factory line, the standard exhaust system left a lot to be desired. To remedy this problem, and crank out a few extra horsepower from your 240Z’s engine, swapping in a new exhaust system might be a good idea. Fortunately, there are tons of different options when it comes to changing up your exhaust system, and you can accomplish some really impressive exhaust notes for a relatively low price point if you desire. Conversely, you could splurge on something like the beautiful sounding Fujutsubo exhaust system built exclusively for the 240Z and really transform your Z in terms of performance and noise. If you want to learn more about some potential exhaust upgrades for the 240Z, check out our article on exactly that topic. These four engine swaps are the most popular and easy to accomplish engine swaps for the 240Z. If you want to read more about 240Z engine swaps and how you could perhaps do your own engine swap, check out our list of the best 240Z engine swaps. Thanks for visiting ZCarGuide! I built this site provide a helpful resource for Z car owners and enthusiasts. I became the proud owner of a 1971 240Z in 2015 and have enjoyed driving, working on, and learning more about the car. Feel free to contact me with any questions or feedback on how I can improve ZCarGuide! Want a weekly email of the latest in the Z Car world, including brand-new online listings, exclusive deals on parts, beautiful restorations, and more? Sign up for our newsletter below! Highly original 280Z in rare 2+2! ZCarGuide is a participant in the Amazon Services LLC Associates Program, an affiliate advertising program designed to provide a means for us to earn fees by linking to Amazon.com and affiliated sites.